Innovative publishers and design-promoters Concrete Hermit are to launch their new east London gallery next week with an exhibition and book launch by artist Ian Stevenson. 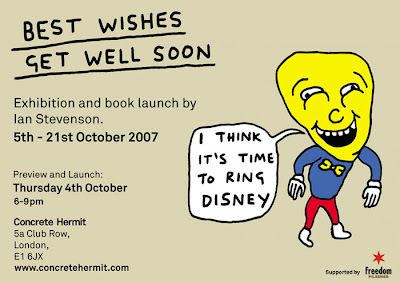 The book Best Wishes Get Well Soon presents a collection of Stevenson’s work to date drawn from sketchbooks through to his high profile client work for the likes of Paul Smith, Perrier and MTV. The exhibition will present new work alongside selected prints. The gallery is located at 5a Club Row, London E1 6JX. The exhibition runs from 5 – 21 October. Private view and book launch Thursday 4 th October 6-9pm.